Today, six DC middle school students and two Learning Life teachers met for the first time to launch an experiment in Washington DC: a global storytelling challenge. Since Learning Life started its Citizen Diplomacy Initiative (CDI) a little more than two years ago, in August 2016, we have recruited some of our CDI families from schools in Washington DC, but we have not established a working relationship with any school, until now. 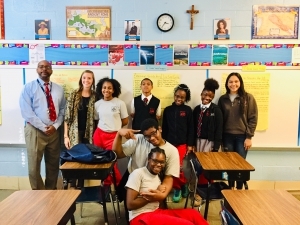 Starting today, two volunteer Learning Life teachers, Nichole Hutchins and Rujjares Hans, both Master’s students in the International Education Program at George Washington University, are leading six students at the Saint Thomas More Catholic Academy (STM), with the assistance of STM Social Studies teacher, Randall Carter, in a challenge focused on telling stories about health from an international perspective. “Countless pressing public issues are health issues, including bullying, depression, loneliness, drug abuse, crime, hunger, obesity, diabetes, homelessness, unemployment, income and wealth inequality, human trafficking, communicable diseases, terrorism, war, pollution, and climate change. Good health is fundamentally important, yet research indicates that lower-income families suffer disproportionately from health problems. Storytelling is a widely useful, resume-building skill any person can develop, regardless of their material resources, and an effective way to learn about any topic, including health. However, there are relatively few opportunities for lower-income youth, including many STM students, to develop their storytelling skill, especially in an international context,” explained Learning Life’s Founder and Director, Paul Lachelier. Thus, from October 22 to December 10, 2018, Nichole and Rujjares will meet with their elementary school students for 1.5 hours weekly to learn, plan and ultimately perform before a live audience two compelling stories about an international issue that affects health. The group will form two teams, each composed of three students and one teacher. Each team will develop its own engaging health story, choosing their international issue and story form (dance, song, poetry, miming, painting, writing, etc., or some combination thereof). Each story, told in 5-10 minutes, must connect the local with the global, either by comparing or connecting two stories in different parts of the world, or by connecting a local story to a global phenomenon or trend. In their last meeting on December 10, the two student teams will perform their stories and be judged by a panel of storytelling experts in front of a live audience of students, teachers and staff. When all is said and done, the challenge should give the student storytellers valuable experience in developing and performing a story, and a deeper understanding of world health issues. Learning Life will survey the students at the start and end of the challenge to gauge its impact on the students’ attitudes and knowledge about the world. If this pilot storytelling challenge proves successful, we aim to do a second challenge in the spring with more STM students with an eye toward expanding the competition to more schools in Washington DC and in other cities where Learning Life works abroad in the coming years. a registered 501(c)(3) public charity. Learning Life is a fiscally sponsored project of United Charitable Programs - a registered 501(c)(3) public charity.